A man and a woman are standing not far from a closed door. The woman is reaching for the door knob. Woman: That must be my quarterly package. I got a subscription so my car GPS maps never get out of date. The second panel shows only the man in a closer view. Man: Those GPS map updates are a rip-off! It's cheaper to buy a new GPS. The third and final panel shows only the woman, in a closer view, handling a half-opened package. 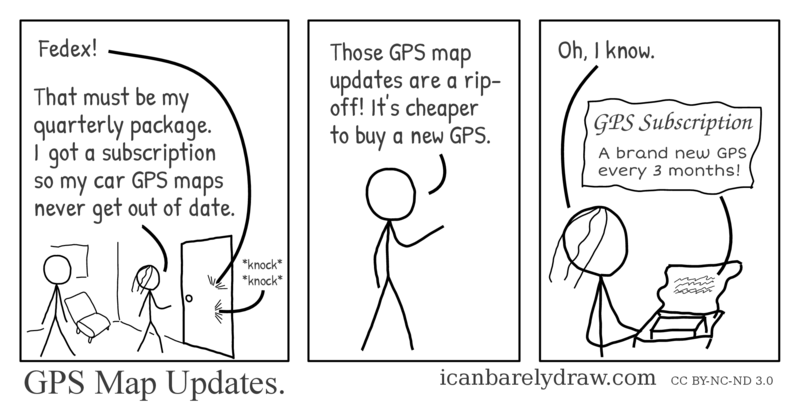 A brand new GPS every 3 months!